Join us on Thursdays at Hart Village Hall at 1 – 2pm for our fun Hart Messy Play class! Suitable for children aged 5 months to 5 years. 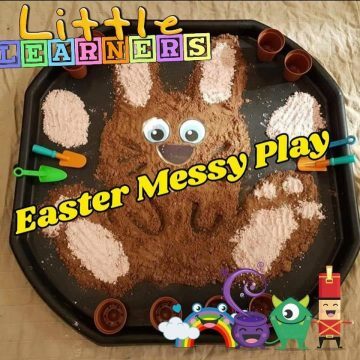 This Hart messy play term will start on the 11th April 2019 and run each Thursday for 4 weeks. Come along and let your child make their mark in the paint, gloop, sand, play dough, slime, cereal and much more! We’re kicking of the new term with 2 Special Easter Events on 11th and 18th of April so join us for some chocolaty messy goodness! If you do decide to join us : Please make sure you and your little ones are wearing old clothes or clothes you do not mind getting messy in. Some parents like to strip their child down to their vests. Make sure you remember to bring a change of clothes, a towel and baby wipes come in handy!